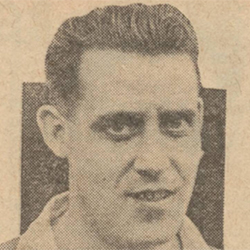 Though his fee is unknown, Willie was reported to be a record transfer for United in August 1945, when he signed for the Club from St Mirren. A stalwart of the game, Willie had joined the Paisley club from Maryhill Juniors in 1934, and remained at Love Street throughout the war years off and on while serving in the Navy. During his most prominent years, he had been mentioned several times for a Scotland cap. He missed very few games in the first half of the 1945-46 campaign for United but failed to settle in Dundee and he requested a transfer in late January 1946. Within a few weeks he moved to Morton. Later that year, however, Willie was served with the first post-war sin die suspension for "rough play", which saw him banned from the game. His ban was eventually lifted in September 1950. Willie was born on this date in Maryhill. United looked to make amends for their East End Park humiliation with a home win against their Perth counterparts, St Johnstone, but, despite a second half fightback, they finished the match at the bottom of the league table with, as yet, no points.